The HydraSleeve is a new way to collect discrete interval samples. With no need to purge or dispose of purge water, this groundwater sampler reduces costs by saving time. 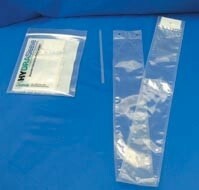 HydraSleeve samplers are inexpensive, disposable, and easy to use. The HydraSleeve instantaneously “cores” a whole water sample from a defined vertical and horizontal interval (usually within the well screen). HydraSleeve samples do not blend fluid from different vertical zones or pull water in from outside the well screen, but instead sample via ambient and/or diffusive flow of groundwater through the well screen. The sample is collected at in-situ pressure without purging and with very little down well disturbance, preventing turbidity, aeration or oxidation of sensitive parameters.